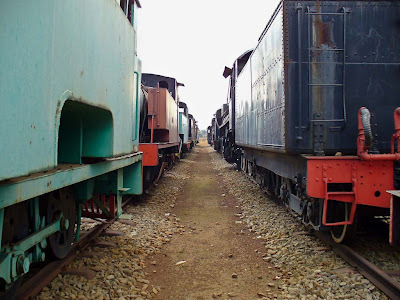 This post is in memory of all the unique and very special locomotives which died in the care of a so-called "MUSEUM" at SANRASM's Chamdor site. 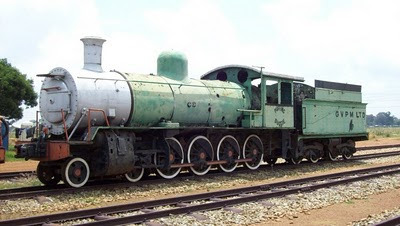 These historically important locomotives, of which many had done industrial service, seemed to be well displayed, yet were in a total insecure environment, and despite a decade of warnings by many people in the steam locomotive preservation community, nothing was done to protect these engines, and they were poor sitting ducks when the scrap thieves were allowed to get away with all the juicy parts. The end result was most disgusting and horrible to see - the pictures are worth a thousand painful words ... how this ever was allowed by the caretakers to happen is beyond any sound explanation. All this apparently happened in 2010, and when discovered by SIA and other individuals in September 2010, the damage was already beyond repair. 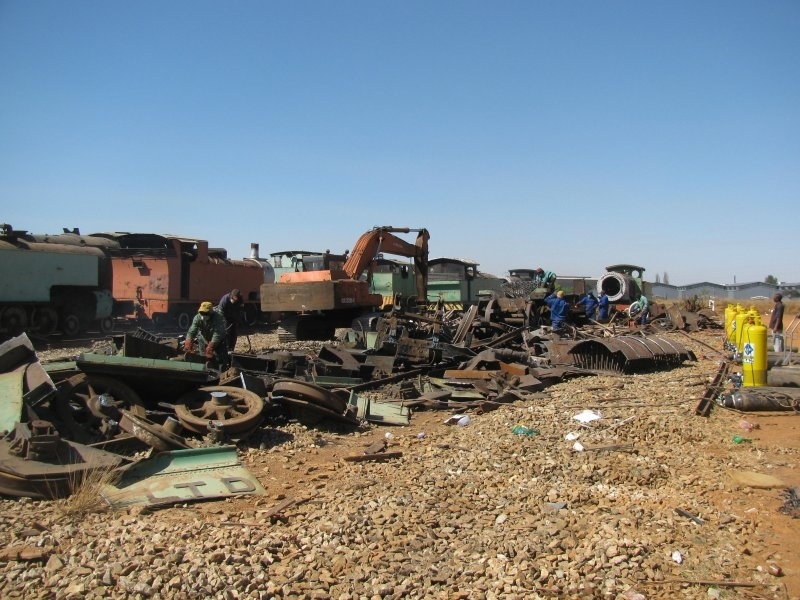 "In September 2010 I once again visited this site and was horrified to see the wholesale destruction happening there. 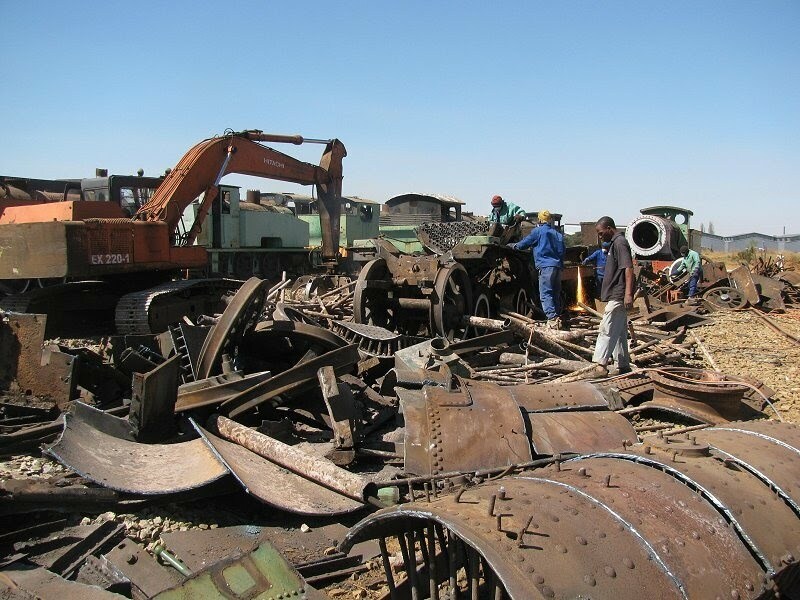 Systematic stripping of the locos with heavy equipment and cutting torches. Removal of sleepers, destruction of complete engines. I was shocked. This collection is finished. There is nothing left of historical significance that could ever be saved. They were even doing it while I was present." "I believe it has been happening since Feb 2010, but has been accelerating ever since. It is done in broad daylight too. 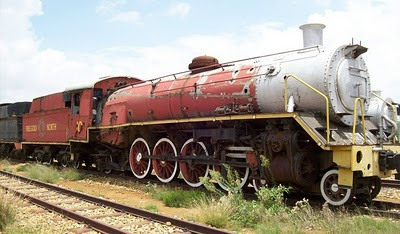 At ReefSteamers, yesterday, they said that RECLAM will start cutting and clearing the site next week. There is almost nothing left that can be used to save anything, the whole collection will go. 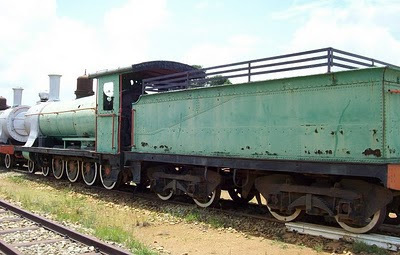 There were 27 or 28 locos at the site. The money from the cutting is to go into an escrow account to be used to move the historically important stuff rotting away at SANRASM." SIA issued a statement confirming that actions were in place to secure the Chamdor site and to prevent further illegal scrapping to happen. 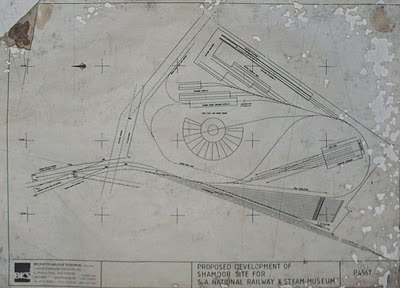 RECLAM GROUP would start to clear the site from Monday 13 Sept 2010. The list below lists some/all? 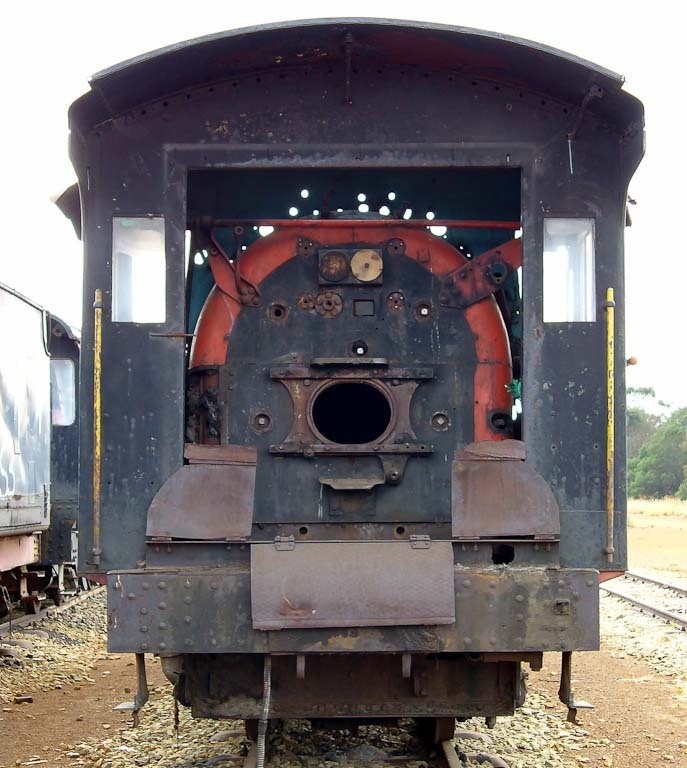 of the engines which were stored at Chamdor in Krugersdorp. Jacque & John Wepener visited Chamdor in June 2007 and kindly provided the photos below. 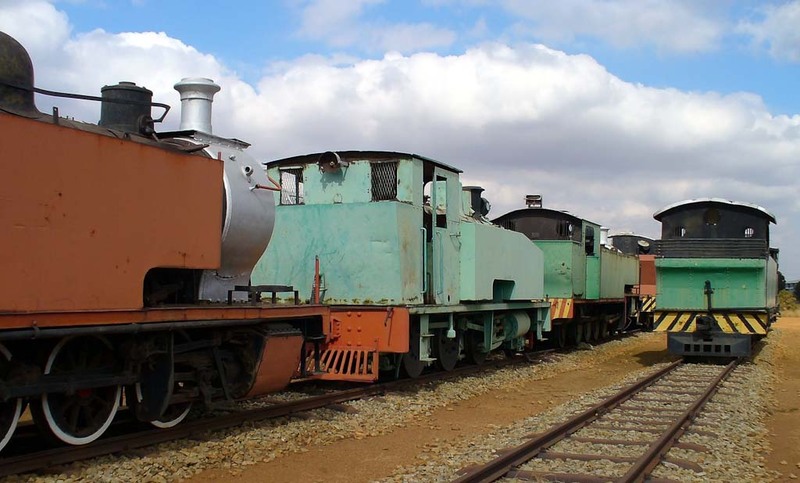 You may want try to identify some of the locomotives below by taking clues from the list above. 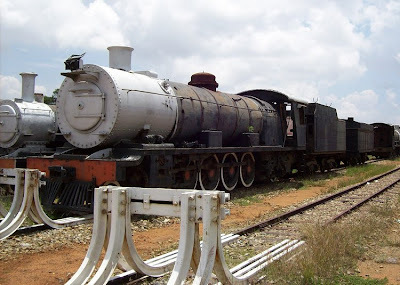 "Puffing Duggie" ex SAR no 1211. She was a 4-8-0 Neilson, Reid & Co works no 6304 built in 1903. Originally a SAR Class 8DW, she was ex Grootvlei Pty Mines (GVPM), Springs, No. 3; (Prev. Tavistock Collieries Ltd, No 1, Formerly South Witbank Coal Mines Ltd, No. 5). Info source: Industrial Locomotives of South Africa 1991 - John Middleton & Huw Williams. Remember, this happened at a "MUSEUM" !!!! The following before (2007 or earlier) and after (September 2010) pictures are all courtesy Derek Walker . Some of these photos were posted by Derek to the FOTR forum. 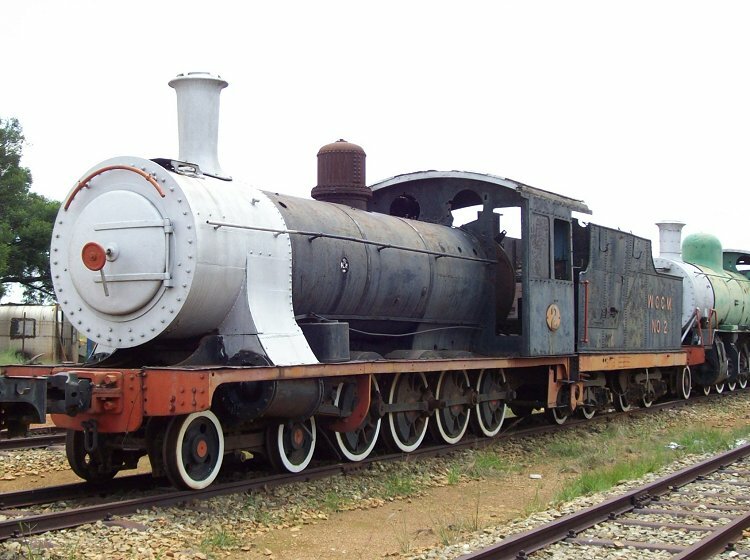 "Puffing Duggie" ex SAR no 1211. She was a 4-8-0 Neilson, Reid & Co works no 6304 built in 1903. 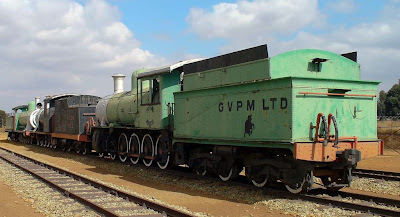 Originally a SAR Class 8DW, she was ex Grootvlei Pty Mines (GVPM), Springs, No. 3; (Prev. Tavistock Collieries Ltd, No 1, Formerly South Witbank Coal Mines Ltd, No. 5). 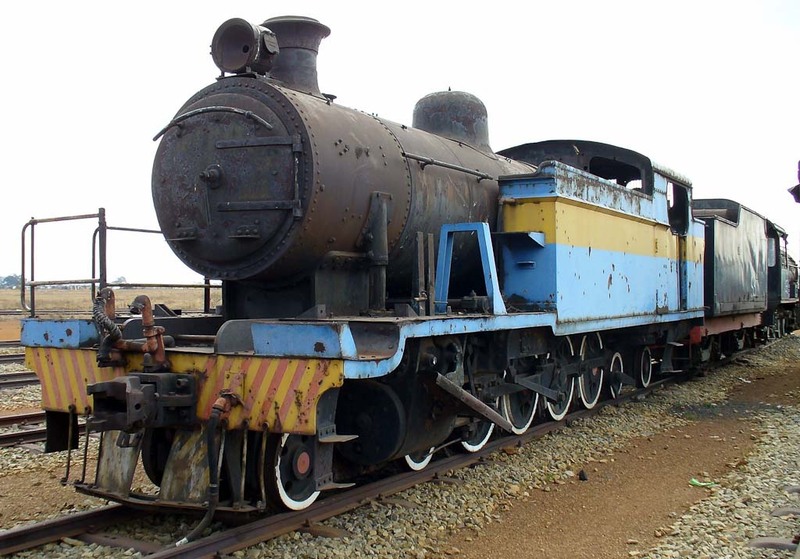 And on 16 September 2010 "Puffing Duggie" was reduced to heap of scrap metal. You can see more guts-turning photos of Chamdor by looking at this pdf document produced by SIA. 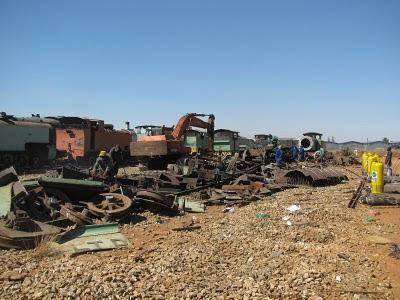 Also have a look at Derek Walker's February 2009 photo's of the SANRASM Chamdor site here. Previously Derek had also documented these two sites on 1st June 2009 - these photos may be found here. 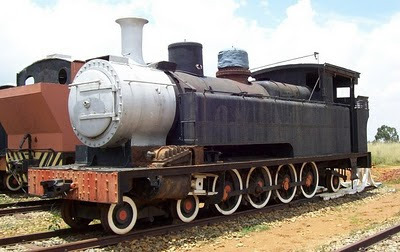 That is so sad, Puffing Duggie was named after my late father (Douglas Moir). He retired from Grootvlei Mine in 1992 as RE. Piet, where can I contact you? I tried your email address on your profile but the link is not working. I saved a sign from a train before they slaughtered it and would like to identify it. It needs to be framed with a picture along with it. What an absolute distructive, cruel nation we have become! No morals, honor or dignity! Live for today!